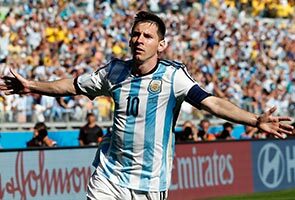 BRASILIA: As the former Argentina international Jorge Valdano once observed: "One does try to avoid comparing Lionel Messi and Diego Maradona. The problem is that Messi doesn't help." The comparisons will only increase ahead of Argentina's World Cup quarter-final with Belgium on Saturday, for it was against the Belgians that two of Maradona's most iconic moments occurred. In a 1982 World Cup group-stage match in Barcelona, a photograph was taken of Maradona facing up to a throng of six Belgian defenders that has become one of the most well-known of him as a player. The image was slightly misleading – the Belgian players were fanning out from a defensive wall, rather than massing in opposition to the squat, raven-haired Argentina number 10 – but it vividly evoked the terror the 21-year-old was liable to spread in opposition defences. Argentina lost the game 1-0 and Maradona's tournament ended in disgrace when he was sent off against Brazil. But in the 1986 competition another meeting with Belgium saw him produce one of his defining performances. In a 2-0 semi-final win at Mexico City's Estadio Azteca, he scored both goals, the second a vicious strike after a viperish dart through the heart of the Belgian defence that left four defenders floundering in his wake. Maradona was said to have carried Argentina to glory in Mexico, scoring five goals and laying on five assists as his country claimed their second title, and 28 years on, Messi is doing the same in Brazil. Having scored four goals in the group phase, Messi's creative side came to the fore in Tuesday's last-16 win over Switzerland in Sao Paulo. While his team-mates toiled around him, Messi was a ceaseless hub of invention, and with penalties looming, it was his burrowing run and pass that allowed Angel di Maria to stroke home the 118th-minute winner. In total, Messi carved out eight chances against Switzerland, which is more than any Argentine player – Maradona included – has ever created in a single World Cup finals game. Messi faces swarms of defenders wherever he turns, but by luring them towards him and then releasing the ball, he can be decisive even when his route to goal is blocked. Maradona also learnt to use heavy marking to his advantage, notably teeing up Jorge Burruchaga for the winning goal against West Germany in the 1986 final with an incisive pass from his own half. He played a direct part in 10 of Argentina's 14 goals at the tournament. Four games into the 2014 competition, Messi has scored or assisted six of the seven goals scored so far. The Barcelona superstar told FourFourTwo magazine prior to the tournament that emulating Maradona was "not a motivation for me to win the World Cup", but the similarities between the two make comparisons unavoidable. Like Maradona, Messi is a short, left-footed number 10 whose key attribute is his dribbling. Both players won the Under-20 World Cup, both made their senior debuts against Hungary, and both were handed the captaincy -- Maradona by Carlos Bilardo, Messi by Alejandro Sabella -- by coaches determined to build their teams around them. Belgium coach Marc Wilmots has insisted that his team "won't only be watching Messi" in the Brasilia game, but as the Swiss found to their cost, it only takes a moment's inattention for him to strike. Messi also has a personal duel to attend to, and there again he treads in Maradona's footprints. Having kept Maradona at bay in 1982, the great Belgium goalkeeper Jean-Marie Pfaff vowed to repeat the feat four years later, only for the Argentina captain to beat him twice. Meanwhile, in seven games against Pfaff's modern counterpart, the Atletico Madrid goalkeeper Thibaut Courtois, over the last two seasons, Messi failed to score. It is an affront that Maradona would not have tolerated.